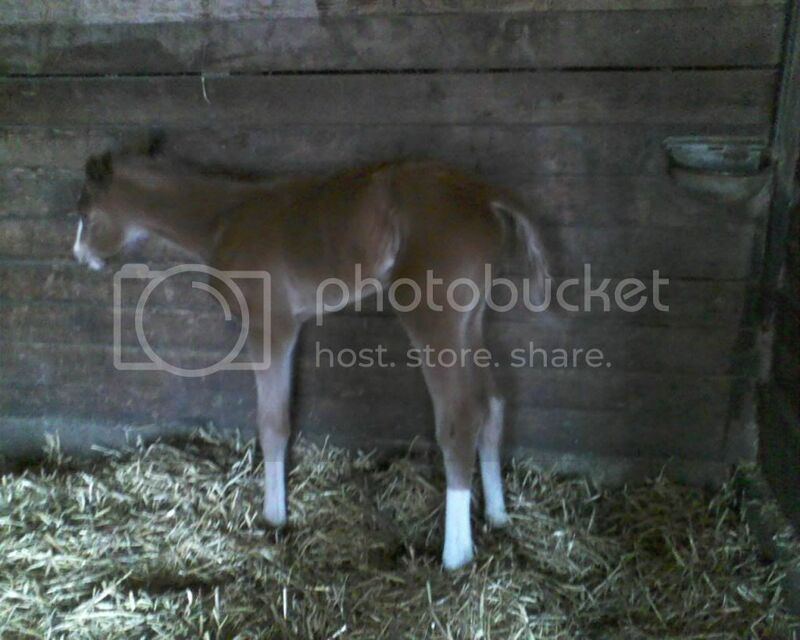 Below is a 2 hour old pic of my newborn filly. Sadly, I lost her mother shortly after due to a ruptured uterus. Grace was two weeks overdue. The filly was upside down at beginning but they managed to flip her over and birth went well post initial problem. 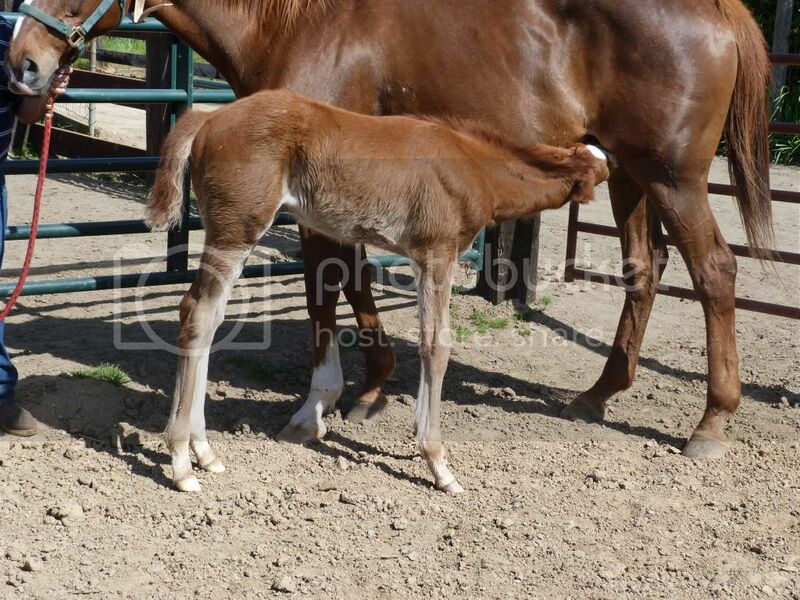 The filly is huge-the biggest they have ever seen at the ranch and likely the contributing factor for Grace's death. We found a nurse mare yesterday afternoon and the bonding process has (hopefully) begun. This is one of the worst parts of the game; elation folded with total sadness and despair. So sorry about your loss but your mare's left you a really, really nice filly. I hope the bonding goes well and that she grows up without incident. Oh I got a lump in my throat and a couple of tears - I know just exactly how this feels. I've raised my own orphan. Be strong for your filly and don't spoil her too much. I'm so sorry about the loss of your mare, zinn. I totally agree, that's the worst part of the game. Her filly looks lovely. Very sorry for your loss. Hopefully this filly can fulfill the dreams you have for her. Oh Zinn, how horrible, she was too young! And she was off to such a great start as a broodmare. 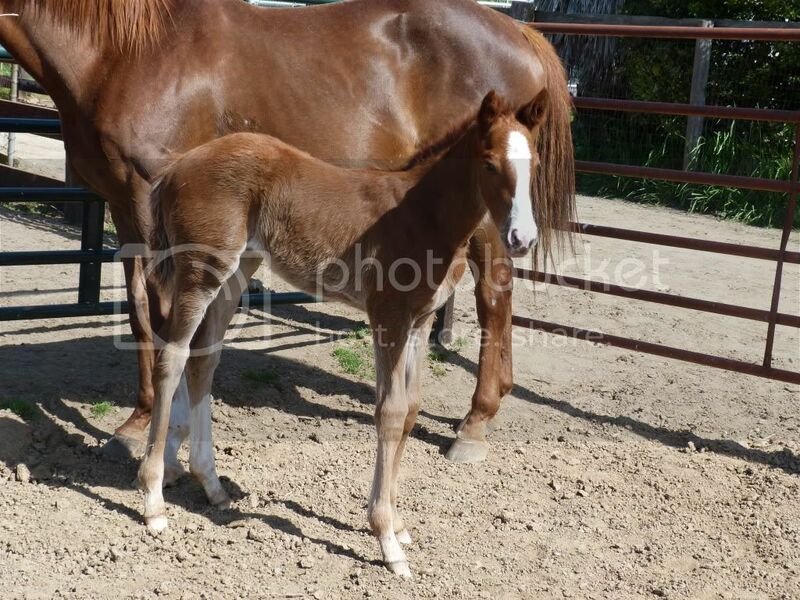 Do you have a yearling or 2 year old from her also? I hope so. Well the nurse mare is allowing her to suckle. We don't think she is producing much milk. We gave her a couple of shots of oxytocin but results so far are inconclusive. We are supplementing with Foalac and my farm manager also has some frozen mare's milk. Gosh this is agony but so far foal is doing OK..
Doc, thanks I have a 4 year old gelding and a 3 year old filly, Take That, who just broke her maiden at GGF in Allowance company. I am hoping to replace Grace with Take That some day but right now I feel so bad over her death I'm not sure I have the heart to continue and chance losing another horse. This is the 5th horse I have lost over 25 years in the game and it's a terrible feeling. Rats. I knew about your older two but hoped you had another one waiting in the wings. It's so hard to lose one. I've only been doing this for 7 years and have lost 3, it always hurts. Hang in there. This is a lovely filly but I am so very sorry for the loss of your mare. It is tough losing them no matter how they go. I've used nurse mares before and they are truly a godsend in instances like this. Best of luck and hang in there! Here's a few pics of my filly at 24 days old taken today. Her step mom takes super care of her. Step Mom is quite similar to her real mom, Grace N Perfection. Both are Chestnuts. I am lucky to have found a good mom..
Last edited by zinn21 on Thu Apr 19, 2012 2:41 pm, edited 1 time in total. Wow, those legs go on forever! Glad she's doing well, Zinn. What a cutie. I'm happy that you have a good nursemare - they are such a blessing and the good ones are worth their weight in gold. Your filly is so beautiful, best of luck with her! Nice filly, Peppered Cat sure throws some big ones. Sorry you lost her mama.